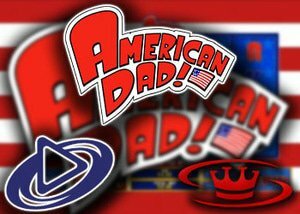 Renowned software provider Playtech has released their latest new American Dad slot and you can enjoy it for free with a no deposit bonus. Motion pictures are often used as a source of inspiration for software producers' latest creations, and there is no good reason why cartoons wouldn't be any different. Seth MacFarlane's American Dad has some excellent material for a fun and dynamic video slot game, and the developers got the task of adapting this cult cartoon into a memorable challenge. Join CIA man Stan and the rest of the Smith clan from American Dad, in this 5 reel, 40 payline video slot. The online game boasts with a sheer number of bonus attributes, mini challenges, respins and other artefacts that will render your gambling experience more challenging and fun than ever. In terms of design, the new American Dad slot has an entire cartoon universe to draw inspiration from. The entire set of the game is themed on the American Flag, with red and white stripes extending behind the reels. As it was expected the game is replica of the cartoon it was based on in terms of the soundtrack and ambiance. All of the characters starting in the show are present on the reels and ready to activate their very own bonus attributes, are present on the reels and ready to trigger their very own bonus feature. The lower value A, K and Q symbols are joined by son and daughter Steve and Hayley, man-in-a-fish's body Klaus and mom Francine. The top paying standard symbol is Stan who awards 250 coins if you land 5 on a payline. The wild symbols is represented by Roger the alien and he will substitute all other icons except for the Schmooblydong Bonus Wheel as well as offering payouts of 125, 300 or 750 coins in its own right. Land the gloriously named Schmooblydong Bonus Wheel on reels 1 and 3 on the same spin and you will be rewarded with a re-spin. In addition, add a third bonus symbol on reel 5 and you will activate the Free Games feature. The wheel on reel 1 determines which character bonus you'll play with the wheels on reels 3 and 5 determining the power up potential and the number of free spins you'll receive - this can be 3, 5, 8, 10 or 25 free spins. You'll then begin spinning with 1 of the following extras in play namely: Stacking Stan, Francine's Holy Grail -Hayley's Progressive Multiplier, Wheels and the Legman and Roger's Random Wilds. What better way to enjoy this new slot than to play for free with a Playtech no deposit bonus?! Join the family by playing it on mobile, desktop and tablet devices from as little as 40p per spin. The new slot American Dad by Playtech is full of surprises and winning possibilities at every spin. The slot is something of an acquired taste - whether you're a fan or not, the wide range of bonus feature extras make this slot adaptation worth investigating. As a leading casino review site in Canada, Casino Bonus King works directly with the most renowned brands to offer first-class entertainment and exclusive promotions to our punter. That is the reason why we recommend that you play this slot at Ace Kingdom Casino. The website has also prepared a unique deal for punters to receive a $/£10 no deposit free bonus.